Sharing the book Wonder by R.J. Palacio with students is certainly not a new idea…most of us have been sharing Wonder with anyone who would listen since the beginning of 2012! Even so, there’s something so amazingly wonder-ful about this book and how it touches readers’ lives. I will never tire of seeing and hearing the reactions of others to this story. This is exactly the reason why I persuaded our 6th grade Reading teachers to begin the school year by using Wonder as a whole class read aloud. We had already “test-driven” the novel as a read aloud with one 6th grade class in the spring of 2012. I had the privilege of beginning the book with them and finishing up their experience with a Skype session with R.J. Palacio on our last day of school. The interest level, immersion, and reactions from the students was amazing to see. 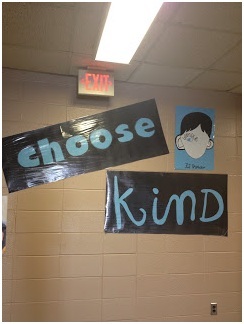 The 6th grade teacher and I really wanted to spread this spirit of “Choose Kind” to the entire incoming 6th grade population and in turn, encourage all our middle school students to “choose kind” in their interactions with each other. 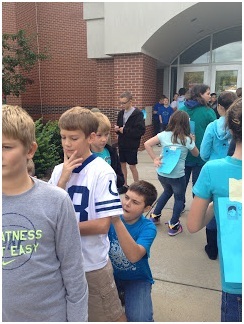 End of 6th Grade Hallway – Visible to everyone going to Cafeteria! Towards the end of the classroom read alouds of Wonder was the amazing birthday party we hosted after lunch on October 10 (Auggie’s birthday). My library assistants and I spent an entire period decorating to really make the area special for the students. (It’s amazing how much streamers, balloons, tablecloths, and party supplies are appreciated by 6th graders!) A few helpful parents served up 87 slices of cake and glasses of punch so the students could join the party immediately. 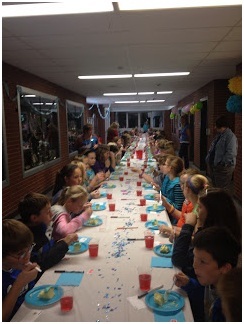 After singing “Happy Birthday” to Auggie, students enjoyed eating the cake. They were also instructed to pick one word to describe themselves and write on the name tag at their place. We encouraged them to talk with their friends about positive words that described each other to use for their tags. 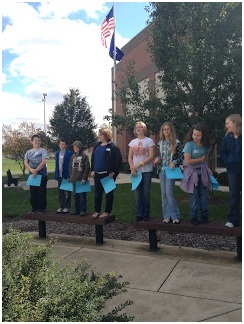 They also wrote only their name on a blue affirmation sheet that read “_________ is a wonder because ……”. After cake and punch, we took the party outside so there was room to move around for activities! First, each class took center stage (by standing on several benches) and received a standing ovation from the other two classes. This moved me to tears to see the students applauding each other and the sheer joy on the faces of the students receiving the applause. 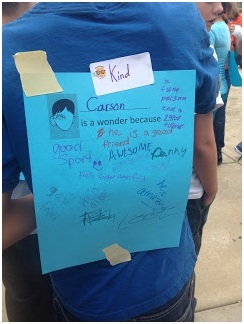 Next, the students taped their affirmation sheets on their backs and took turns writing why each of their classmates “is a wonder”. This was a flurry of movement as students wanted to write on EVERYONE’S sheets and have teachers sign theirs as well. Afterwards, I watched the students clutching their blue sheets of paper, excitedly whispering to each other all the amazing comments that had been written on their papers. The comments were anonymous which made it that much better. I’m fairly certain all 87 students were beaming with pride because someone thought they were special. 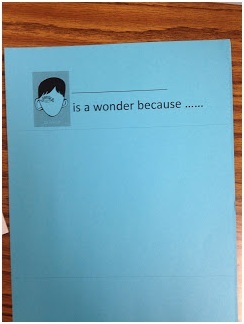 The birthday party was a real bash but my most favorite activity with Wonder was the library project I taught individually with each class and collaborated on with Mr. Etkin and Mrs. Posey: 1-2-3 Wonder as part of the #WonderSchools initiative. Our collaborative video may be seen here. Sherry Gick is a school librarian for Rossville Consolidated Schools. She loves her job, running, & her family.You can find her online at www.thelibraryfanatic.com and on Twitter as @LibraryFanatic. This is the most powerful story I have read in a long, long time. I only discovered it this year and can’t wait to read it to my 4th graders. I love the idea of writing on each other’s backs. Must borrow that one. Thank you! What a fabulous idea to celebrate the culmination of the readaloud with a party for Auggie! We read Wonder at the end of last year – my ex-sixth graders are still talking about it. 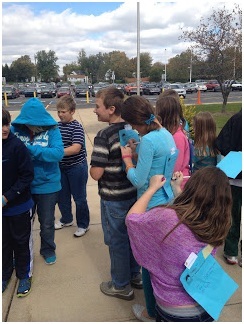 But I love the idea of reading Wonder as a sixth grade experience – they will never forget this. Where did you get the choose kind banners in your picture? I’d love to get some. Such inspirational ideas, Sherry! I love the idea of an August Pullman award. I’ve presented this to our anti-bullying committee for a school-wide read aloud. I hope they can come up with some way to get Augie’s story out there to as many students as possible! Thanks for sharing the details of al your hard work! I’d also like to know how you enlarged the cover for the banner. I’m reading Wonder to my 8th graders as a read-aloud. Just started and, so far, they are loving it. I’m thinking about borrowing the idea of the ‘Affirmation Sheet” activity. Let you know how it went. Hi! I was just wondering how it went with your 8th graders. Stephanie, it worked really well. At the time, we had some social issues going on in the class, and many parts of the novel worked beautifully as a springboard for discussions and conversations. This book really got to me. I love this idea, thank you so much for sharing. I can’t to implement these ideas with my students. I added a link to this post on my blog.